Construction, concrete and masonry pros should probably start 2018 off on the right foot — learning about their trade, shopping for new equipment and enjoying one of the most entertaining towns in the world. 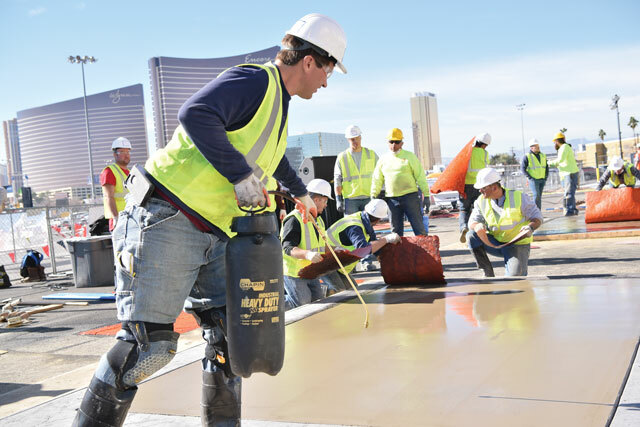 World of Concrete 2018 (WOC) offers that and more. The most important annual international event of the year for concrete and masonry professionals, WOC 2018 expects to attract 60,000 professional registrants and 1,500 leading suppliers from around the world. Show organizers are predicting this will be the largest WOC in nine years. To help plan your trip, we’ve compiled a quick show summary and a showcase of the coolest products being exhibited. • The Producer Center: a marketplace of materials, equipment and demos for concrete producers. • Material Handling: offering trucks, excavators and more for material delivery, distribution, concrete placement and earth moving. • Concrete Repair and Demolition: housing a display of surface preparation equipment, scarifying, sawing equipment, concrete repair and other demolition products. • World of Masonry: showcasing products, tools, information and technology for masonry professionals. There’s so much more. Visit worldofconcrete.com for more details, or just turn the page and begin exploring the cool equipment and next generation machines being exhibited at WOC 2018. Despite their compact size, the John Deere G-Series skid steer lineup can handle tasks reserved for larger equipment. These skid steers start at 50 hp (312GR and 314G), move up to 65 to 75 hp (316GR and 318G) and reach more than 92 to 100 hp (330G and 332G). The smaller models offer the option of radial or vertical lift, and customers can choose the Deere system that best fits their application needs. Improvements in horsepower-to-weight ratios and an optimized boom design enable lift heights over 10 ft on the larger vertical-lift models and a 20 percent increase in breakout forces on the radial-lift models. Choose between standard foot and hand controls or enhanced (EH) joystick controls. For more info, visit booth C5351 or deere.com. 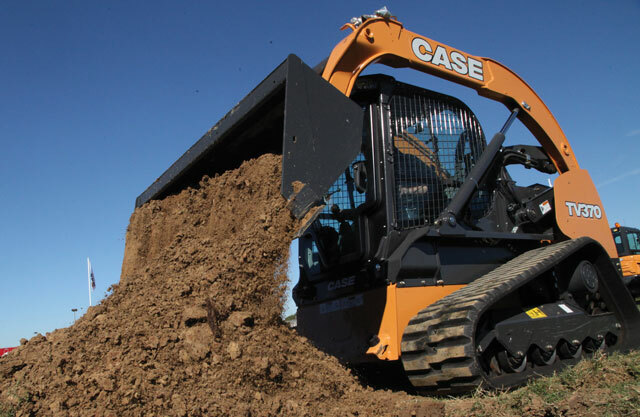 The Case TV370 compact track loader is a new 74-hp machine that combines a maintenance-free Tier 4 Final solution with the strength and reach of a large-frame compact track loader. The TV370 provides a 3,700-lb rated operating capacity and a vertical-lift design that makes it ideal for loading trucks and lifting and placing heavier palletized materials. The machine provides excellent auxiliary hydraulics for traditional attachment use in standard (24.2 gpm at 100 percent efficiency) and optional high-flow (37.6 gpm at 100 percent efficiency) hydraulic setups. Additional performance highlights include an 8,776-lb bucket breakout force and a 10-ft, 11-in. hinge pin height. For more info, visit booth C5748 or casece.com. The all-new Gehl RT215 compact track loader is a 72-hp machine with simplified controls designed for ease-of-use and enhanced control responsiveness. With a rated operating capacity of 2,150 lbs, the RT215 provides an economical solution for applications that don’t require the sophistication of an electrical control system. 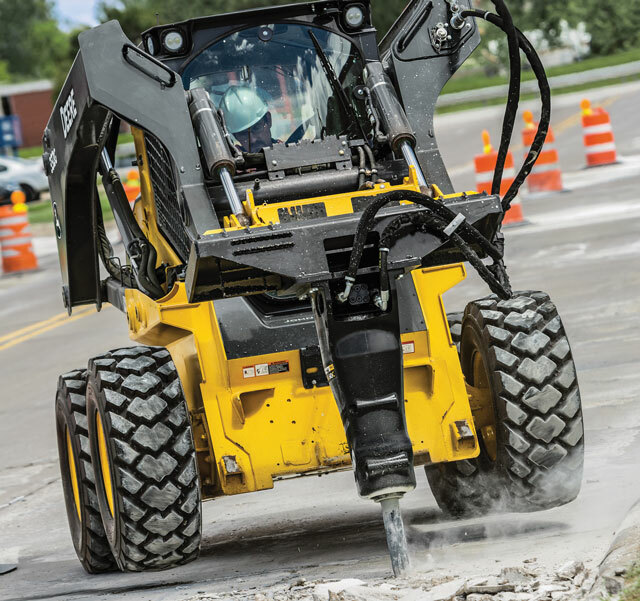 The RT215 includes Gehl’s industry-exclusive features such as standard automatic hydraulic track tensioning, IdealTrax, and an optional IdealAccess foldup door. 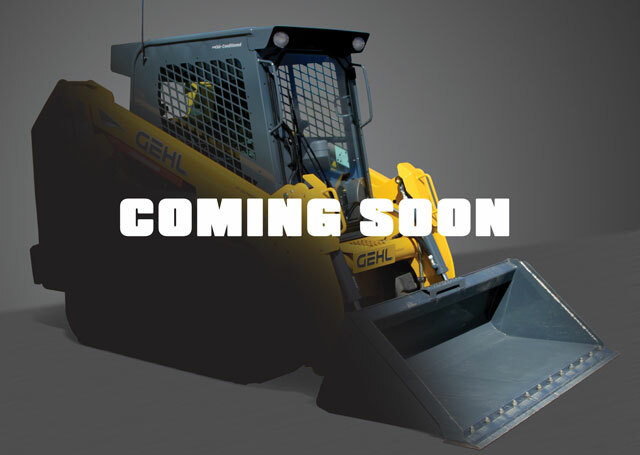 The new track loader is manufactured in Madison, S.D., under the Gehl brand. The corporate headquarters for Manitou Equipment America is in West Bend, Wis. For more info, visit booth C5845 or gehl.com. 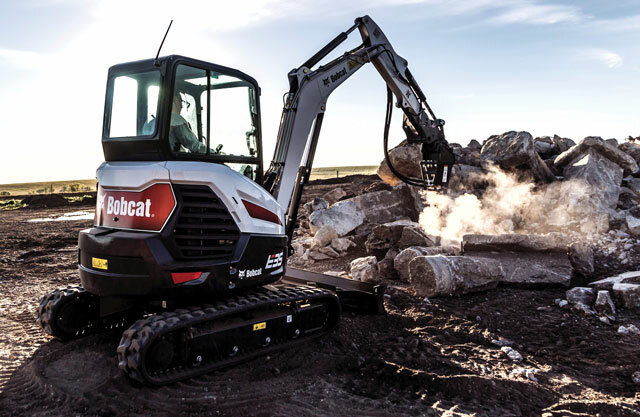 The new R-Series E35 compact excavator from Bobcat Co. features a bold, distinct design, helping boost operator productivity and comfort, as well as machine uptime protection. A new dual-flange track roller system has been added to provide up to 15 percent increase in over-the-side capacity for greater digging performance and slewing ability. Operators will also experience improved ride quality, high-quality finish and a redesigned cab for a great operator experience. Bobcat is a global brand with more than 550 dealer locations in North America. For more info, visit booth 5873 or bobcat.com. Hyundai Construction Equipment Americas will feature the R60CR-9A compact excavator, a 6-ton model powered by a Tier 4 Final-certified Yanmar engine rated at 63 hp. An advanced LED control cluster provides operator-selected machine preferences. It displays engine rpm, engine oil temperature, water temperature and info for all electronic devices. Key specifications include: an operating weight of 13,450 lbs; maximum dig depth of 11 ft, 9 in. ; standard bucket capacity of 0.24 yd3; and bucket breakout force of 9,190 lbf. 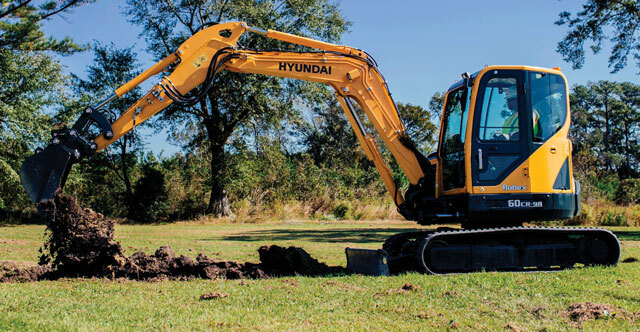 The R60CR-9A excavator is protected by Hyundai’s three-year, 3,000-hour standard warranty and five-year, 10,000-hour structural warranty. For more info, visit booth C7213 or hceamericas.com. Kubota’s new U27-4 will be available at dealerships in the first quarter of 2018 and features: adjustable auxiliary flow hydraulics; an auxiliary diverter valve; two-speed automatic downshift travel; as well as best-in-class reach and dig depth. The new U27-4 also boasts one of the largest operator stations in its class with a minimum tail swing design. An enclosed cab option with heat is also available for the new U27-4. The U27-4 will replace Kubota’s popular U25S model. 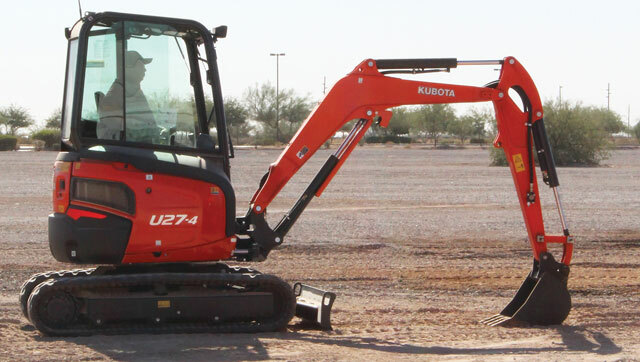 Kubota is one of the world’s top selling compact excavators. With outstanding utility and efficient operation, Kubota can help you tackle tougher jobs in even tighter spaces. For more info, visit booth C5661 or kubotausa.com. Caterpillar recently introduced its first-ever utility vehicles — the gasoline-powered Cat CUV82 and diesel-powered CUV102D. 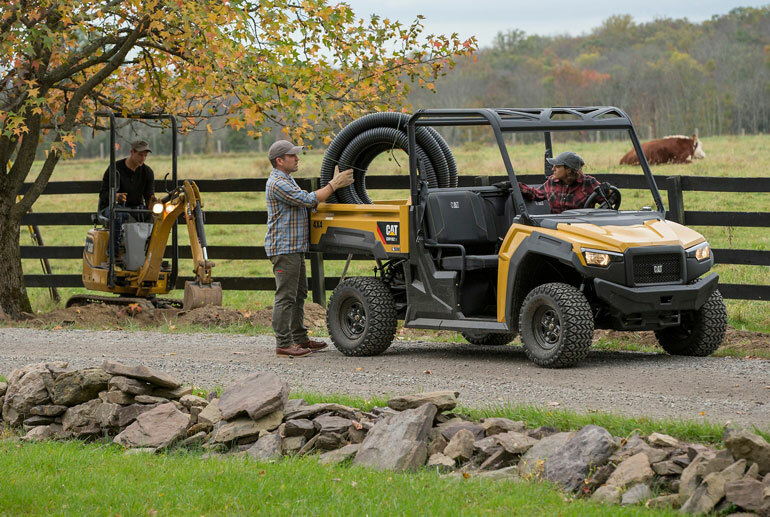 Beginning with a clean design sheet, Caterpillar gathered extensive customer and dealer input to build a UTV that delivers a combination of durability, comfort and maintenance simplicity. The CUV82 and CUV102D feature a rugged steel cargo bed and offer a 1,000-lb total rear cargo capacity and a 2,000-lb towing capacity for performance in a variety of applications. The new CUV082 and CUV102D utility vehicles boast a four-wheel independent suspension system with a front sway bar to provide stability at full load. For more info, visit booth C6061 or cat.com. Pengo will be showcasing its InterLok coupler. 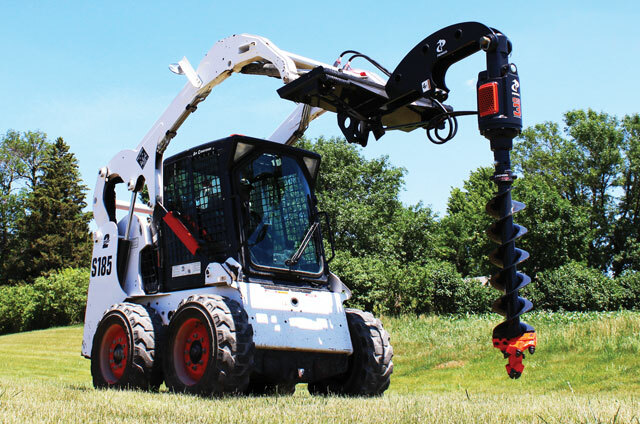 This innovative coupler system allows the Pengo Aggressor auger to be equipped with three different connection sizes: R-256, H-200 and H-250. The InterLok system is a variable geometry auger bit coupler. The coupler allows the auger bit to utilize different coupler (hub) connections, eliminating the need for auger bit adapters and providing a solution for adapting auger bits to numerous types of auger drives with various output shaft sizes. This new coupler system allows for more universal adaptability, making it a perfect solution for the rental dealer by reducing inventory but still ensuring users have the right tool for the job. For more info, visit booth C4621 or pengoattachments.com. 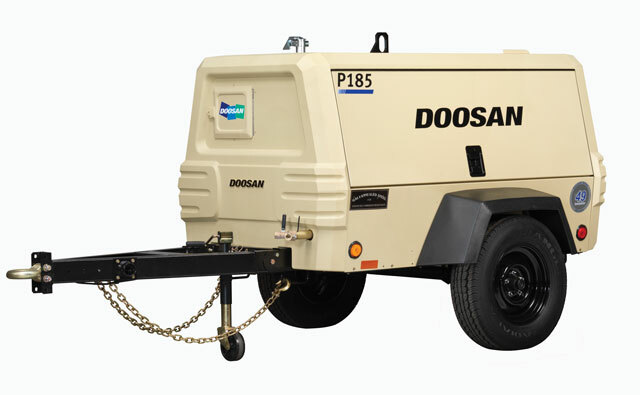 The Doosan Portable Power P185WDO air compressor is powered by a Tier 4 Final-compliant Doosan D24 engine with a diesel oxidation catalyst (DOC) aftertreatment system, which is virtually maintenance-free. The high-performance engine provides the P185 with reliable power and improved cold starting capability, while delivering a 7 percent increase in fuel efficiency compared to previous models. Proving that power doesn’t mean being loud, the P185 offers one of the industry’s lowest sound levels at 74 dBA. With the Doosan D24 engine at the helm, the P185WDO delivers 10 hours of runtime at 100 percent load and 500-hour service intervals. For more info, visit booth O31232 or doosanportablepower.com. Wacker Neuson is introducing the industry’s first emissions-free, cordless, battery powered vibratory rammer. 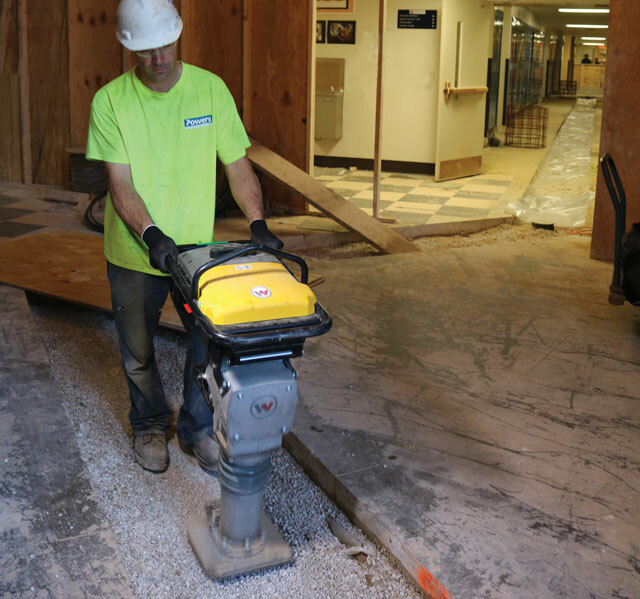 Using lithium-ion battery technology, the AS50e is ideal for commercial interior construction or renovation projects, for use in poorly ventilated areas including trenches or in sound-sensitive areas such as hospitals as well as for rental yards and environmentally conscious builders. The AS50e is convenient to operate with a quick, push button start and is easy to guide along walls. The AS50e weighs 154.5 lbs and hits at a percussion rate of 680 blows per min. The long-life battery is separate from the rammer and can be replaced in a few quick steps. For more info, visit booth O31806 or wackerneuson.us. 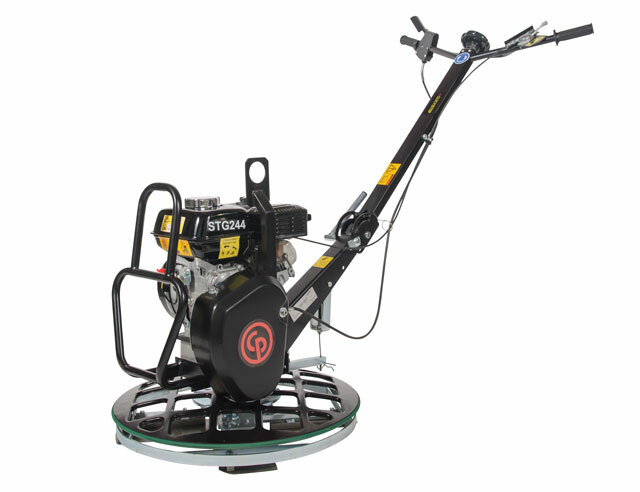 Chicago Pneumatic Construction Equipment will be featuring a walk-behind power trowel line with three models ideal for most concrete finishing applications. This includes the STG244 (24-in. blade), the STG375 (37-in. blade) and STG479 (47-in. blade). With QuickStop, the blade rotation stops immediately with a zero-degree handle spin. Although blade-rotation is stopped, QuickStop does not shut off the engine when the trigger is released. Instead, the feature allows the speed to be adjusted without damaging the belt and clutch. User-friendly features include a solid steel palm trigger and foldable low-vibration handles. Unique to STG power trowels is a maintenance stand for easy access. For more info, visit booth O31159 or cp.com. The new range of Perkins Syncro engines, designed specifically to address the unique challenges of the compact equipment and rental markets, will be showcased at WOC. The 2.2-liter, four-cylinder engine comes in two options — one turbocharged and the other turbocharged and aftercooled. Power has been boosted to 67 hp with a maximum torque of 208 Nm at 1,800 rpm. The turbocharged-only model offers up to 48 hp. 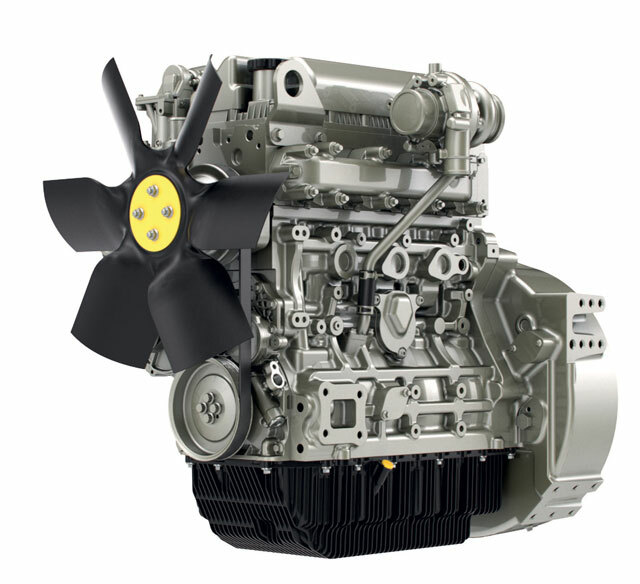 The high power and torque density of the Perkins Syncro range gives equipment manufacturers the opportunity to move to smaller, more compact engines. With up to an 8 percent improvement in fuel economy, the 3.6 liter offers up to 134 hp and up to 500 Nm of torque. For more info, visit booth C5979 or perkins.com. Atlas Copco Construction Equipment North America has introduced a completely redesigned range of eight QAS mobile generators for prime applications. Covering power ratings from 25 to 330 kVA, the fuel-efficient lineup offers the latest Tier 4 Final engines and footprints up to 20 percent smaller than the previous generation. The new paralleling option is easy to use and provides additional benefits in terms of versatility, reliability and fuel efficiency. 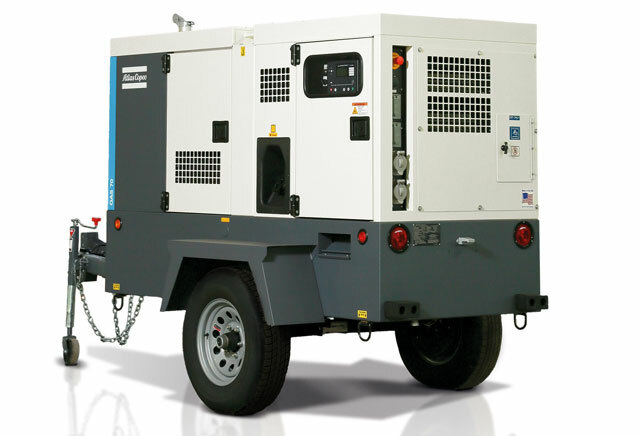 Equipped with an Isuzu, John Deere or MTU Tier 4 Final diesel engine, QAS generators pack reliable power into a compact enclosure that is weather-resistant and sound attenuated. Easy operation of the new QAS generators begins with an intuitive controller, able to start the generator after just two simple clicks. Depending on the model, the generators can reach up to 40 hours of runtime per tank of fuel. For more info, visit booth C4309 or atlascopco.com. For more World of Concrete info, click this link. We guarantee concrete info. Get it?